You may not equate furnaces with water damage. After all, furnaces keep you warm when temperatures outside start to drop and have nothing to do with water themselves. However, pipes around your furnace may have a problem, requiring you to take immediate action to correct the issue at your North Scottsdale, AZ, office building. Thankfully, there are some easy ways to mitigate a furnace flood and get things working correctly once more. Depending on the size of your building, you may have more than one furnace. All of these may be located in areas of your facility where there is an intricate network of pipes and ducts. It’s not uncommon for these and other flaws to present themselves and cause a flooded furnace. Old pipes start to corrode and leak water on the floor by the furnace. Water leaks into the furnace from underneath due to a weak foundation. Water drips onto the furnace from above from water in the ceiling. Your first task should be to remove the water around the furnace. You can do this by extracting the water with a shop vac or other machine. Once you remove all of the water, make sure you thoroughly the dry the area. Open windows to get ventilation, and set up some fans nearby to get air moving even more. You may not know how long the water has been leaking and causing the furnace flood. There could be some concerns with mold and other unwanted substances. Thoroughly clean and sanitize the area around the furnace and the outside of the furnace itself. An extensive furnace flood may require a flood mitigation team to get inside the furnace and examine the extent of the damage. The pros have the best tools and skills to get the job done. Furnaces and water aren’t a good combination. However, if a flood damages this appliance and the area around it, try the tricks and call a professional. It’s unpleasant to discover black mold in a building you own, but it’s not the end of the world. If you handle the problem properly, you can get rid of it for good. Here are four solid pieces of advice to follow when your building in Rio Verde, AZ, has a mold issue. Mold cleanup is not something you should try to do yourself. Mold remediation specialists are trained and certified to find all the places mold is hiding in your building and get rid of the growth entirely. It is better to rely on their expertise than to keep scrubbing mold off the wall only to see it return again in a few days or weeks. If you see a fuzzy or slimy growth on the ceiling, it’s obviously too late to prevent black mold, but you can take steps to make sure it doesn’t go any further. Turn off your HVAC system so that it doesn’t carry mold spores from the concentrated growth to the rest of your building. If you have a leak, turn off the water main so that you can minimize the damage, thus giving mold less area to cover. Resist the urge to handle any items that have mold on them. When technicians arrive to assess and clean your building, they can also determine which items can be salvaged and which ones will need to be thrown away and replaced. An ongoing moisture problem can cause materials to mold. Covering the spots between your restroom tiles with more caulk or painting over a moldy wall doesn’t get rid of the mold. It just makes it harder for the professionals to get to. No one likes to see black mold. With timely response and professional remediation, however, you can resolve your fungus problem and keep it from returning. When a business property has to deal with a flooding issue, the financial loss isn't just measured in how much it will cost to remove the water standing in a break room and then the clean-up. Every day that its doors are closed means a loss of income to cover the regular bills as well. Many businesses today are operating on a shoestring for a budget, and it seems to be getting tighter despite the recovery of the last two years. Any business that has to turn away customers for even just a few days risks not reopening them. Water damage in Scottsdale commercial properties has to be dealt with immediately. SERVPRO has the experience and equipment to help them reopen as soon as possible. 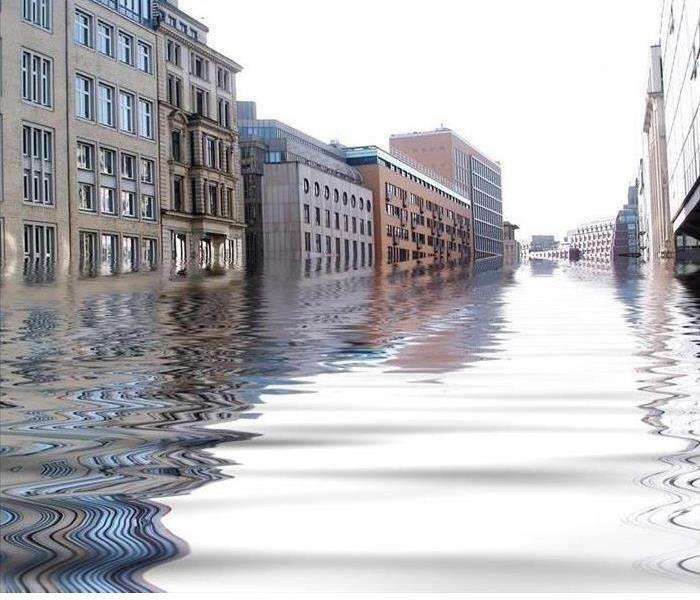 Commercial property flooding usually occurs in an area that isn't noticed immediately. Once it is discovered, most businesses have to close immediately. That's already one day's receipts lost. To stop it, professional removal and remediation services have to be on-site that same day to find the source of the flooding, stop it if necessary and begin the clean-up process. Arizona state and Scottsdale safety laws require that standing water has to be removed and dried out before employees can return to work. If water isn't removed quickly enough, then there will be concerns over structure damage and possibly even mold damage. If that happens, then a day or two closed can easily turn into a week or longer. Helping you reopen your business is our goal. We understand that getting back to your customers is the lifeblood of your business, and it has to begin circulating again as soon as possible after the flooding stops. If a damaged pipe, storm water or an employee error has shut down your business, call us today at SERVPRO of Scottsdale at (480) 998-7989 to get you cleaned up and reopened. SERVPRO of Scottsdale is ready to respond to your Fire & Water Clean up and Restoration. In the aftermath of a disaster in your office, there are many moving pieces and plenty of people working hard to resolve the matter. You may not think of your insurance claim services relying on the expertise of a disaster cleanup team. However, when the cleanup process gets underway quickly and efficiently, it may amaze you just how much easier it is for your insurance company to get on the ball as well. What Happens After an Emergency? Despite your best efforts to keep your office safe, incidents can occur. If you experience a fire, flood or mold in your North Scottsdale, AZ, workplace, it’s essential that you take the proper steps to begin the recovery process and to ensure that you don’t have to pay the repair bill. Contact a reputable, commercial disaster response team to initiate cleanup and restoration. Call your insurance company to report the situation and file a claim. Communicate with the emergency response company to establish repair timelines. Your primary objective following an emergency at work is to make sure you and your staff can return to work in a safe, clean environment as soon as possible. The insurance company won’t go too far in the claim services process until the restoration team responds to you and gives an assessment of the damage and repair needs. The cleanup company also wants to know your insurance company will cover the damage and work. Not all disaster recovery companies are equal. When you hire the professionals at SERVPRO, you can have confidence that the team will communicate effectively with your insurance agent to start the claims and payment procedures. The faster the cleanup and restoration company response to your disaster, the faster your insurance provider will do its part. Claim services don’t have to get bogged down and delay your coverage. When SERVPRO is involved, you know everything should proceed well. Water damage can become a serious problem in a matter of hours. Here are five tips for mitigating damage as soon as possible. Whether the damage is due to broken pipes or a sewer backup, it is crucial to fix the underlying problem. Otherwise, an issue will continue or reoccur. A homeowner may want to contact a plumber. Eliminating moisture as quickly as possible is the most important mitigation measure. A homeowner can use a mop or wet vac. A service that specializes in water cleanup may use pumps and other professional equipment. It may be necessary to clean and sanitize the area depending on the category of water damage. Damage caused by clean Category One water can simply be dried. Clean water left standing as long as 72 hours or water from an appliance leak may be contaminated. Category Two gray water may contain chemicals and microbes and requires disinfection. This is also the case with Category Three black water, which could contain solid waste. It is also important to promote drying. Restoration specialists may recommend increasing ventilation or using a dehumidifier to draw out residual moisture. Some contents may be candidates for cleaning and restoration while others should be disposed of and replaced. Porous materials exposed to contaminated water can be difficult to clean and may continue to pose a mold risk. Most non-porous items can be restored. Porous materials damaged by clean water can usually be dried and restored. These mitigation measures can limit the severity of any type of water damage. Keep in mind that mold may start growing within just 24 to 48 hours. Rather than risk further primary and secondary damage, contact mitigation and restoration specialists in Scottsdale,AZ. Is plant mildew getting you down? Many homeowners in Scottsdale,AZ, are frustrated by the growth of mildew on household plants, which is common in humid and wet climates; and they are not sure how to get rid of it. Fortunately, there are four steps that you can take to remove this pesky mildew. 1. Move the plant. 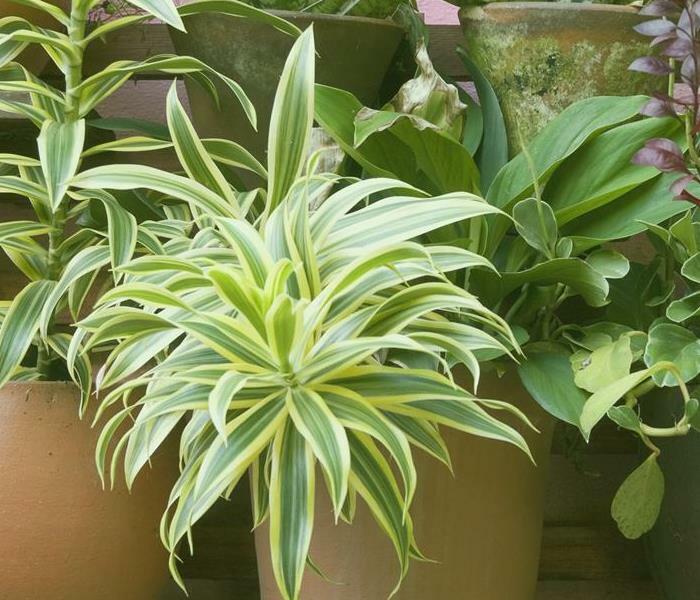 If your mildew-affected plant is of the indoor, potted variety, consider moving it outdoors before doing anything else. The following steps explain why this migration is so important. 2. Wash your plant. Now that you’ve moved your plant outside, spray it with plain water to remove as much mildew as possible. This is especially important if the plant mildew is very prominent. 3. Cut off the mildew. If you can, cut off all the mildew. This is a necessary step to take because it can help improve the plant’s air circulation which should allow it to stay drier. If your plant is fully or almost fully covered in mildew growth, you may have to face the fact that the plant will not survive cutting. 4. Give it sun. Now that you have cleaned your plant and have it out in the open air, adding some warm, bright sunlight should help it stay dry and mildew-free. This final step is especially important if your plant keeps growing mildew. Many homeowners are confused about the difference between plant mildew and mold. Learning how to identify the two is an important additional step to take when trying to find a solution to your mildew problem. It is actually quite easy to tell mildew apart from mold, as mildew will never grow on anything besides a plant. In other words, the growth you see on walls, in the basement, or at other locations around the house is most likely mold and is probably not mildew. If you still have questions about the two or need help with mold and moisture issues, contact a mold remediation service near you. SERVPRO Remediates Mold Infestations in Scottsdale Properties. It's easiest to control and repair mold damage in its early stages, but many homeowners aren't sure of what signs to look for. Left to spread, mold can affect the health of humans and animals, create odors that are very difficult to get rid of, and cause damage to your home's structure, flooring, and possessions. Though the weather in town is typically warm and on the dry side, it's not uncommon for homeowners to encounter mold damage in Scottsdale. If you suspect that your home is in need of mold remediation, it's important to contact a skilled team, such as SERVPRO so that the problem can be remediated efficiently. Persistent moldy (musty) odors. Mold can often be smelled before it is seen, so don't ignore any lingering odors that persist in your home. Contacting our experts at SERVPRO for an inspection when you first smell mold can help prevent the problem from getting worse. Remember, this is like a smoke alarm, warning you of impending problems. Increased humidity and condensation. Mold thrives in humid, wet conditions, and if your home's humidity has noticeably increased the risk of mold damage becomes greater. The higher humidity and condensation in your home could be the result of a roof in need of repair, faulty HVAC system, or your home's proximity to a nearby lake. The RH, relative humidity, in your house can be adjusted and stabilized with the use of one or two dehumidifiers. Leaking water. Water leaks from burst pipes, cracked exterior walls, and damaged roofs are notorious for leading to mold infestation. Leaks can go undetected for months or longer, and combined with a mold infestation, can weaken the framing, resulting in severe structural damage. 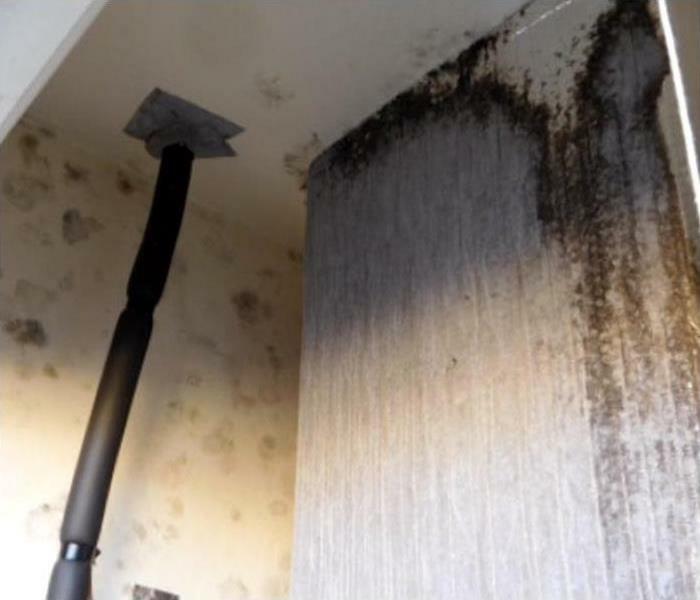 Mold damage is a serious matter, but you can trust the professionals at SERVPRO of Scottsdale to get your home back in top shape. "Like it never even happened." Flooding is perhaps the most obvious cause of mold growth. No one wants to find mold growing in their home. However, it’s a common occurrence the average homeowner in Scottsdale, AZ can expect to face once or twice in a lifetime. Regardless of how commonplace the issue might be, when you locate a little patch of mold under the sink or elsewhere in your house, it’s probably your first instinct to ask yourself, “How did this get here?” The answer is typically easier than you might think. Where’d This Mold Come From? These issues are simple enough to repair, but they can be difficult to identify at times. If left unchecked, mold is likely to form in areas that experience water-damage due to these problems. Over time, keeping your home just a bit too warm can facilitate the growth of black mold, just like common moisture issues. Humid air traps water in an enclosed space, which then condenses on walls. Mold spores come into contact with this moisture and latch onto the source. Keeping the thermostat a bit lower when you expect to be out of the house can combat mold a bit. Flooding is perhaps the most obvious cause of mold growth. During flooding of any intensity, parts of your home are subjected to a huge amount of standing water. Even after a bit of professional mold cleanup, it’s likely some of this water has soaked into the walls of your home where it can provide moisture for mold growth. 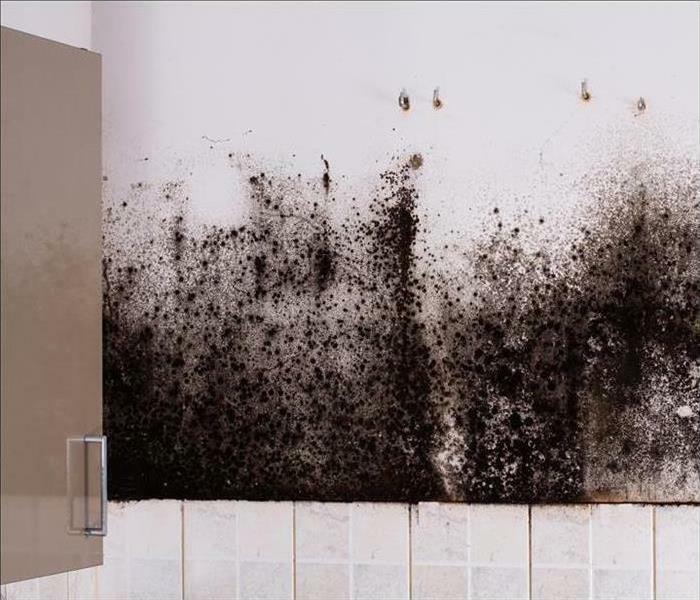 Understanding the causes of black mold growth can help you prevent the necessary conditions for a thriving mold contamination in your home, allowing you and your family to live and breathe easily. 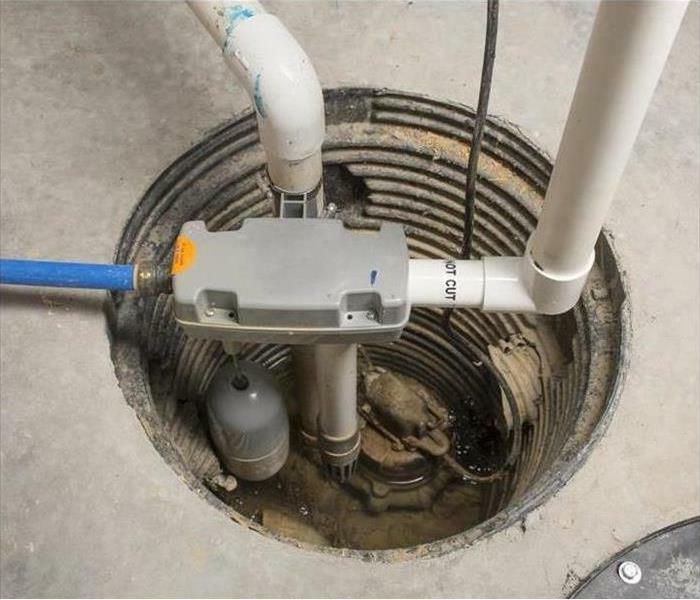 SERVPRO Says: A Sump Pump Can Prevent Water Damage in Scottsdale. Severe weather always seems on the horizon increasing the risk of significant water intrusion into your home. 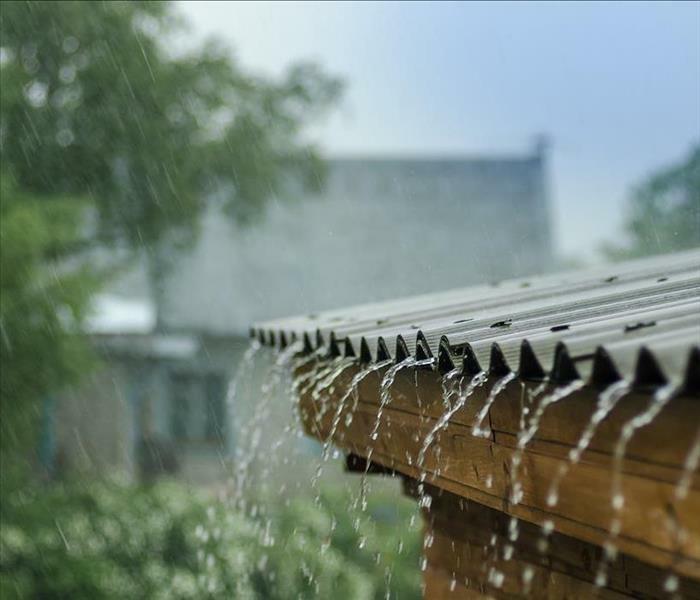 When high winds combine with rain and hail the integrity of your roof, windows or siding may not hold allowing water to leak inside and cause severe damage to the structure and your personal property. SERVPRO has the staff and equipment to remove water from walls, ceilings, floors and more, including cutting-edge technology to restore keepsakes your family would be heartbroken to lose or be forced to replace. Thunderstorms and downpours respect no area and are a possibility in your neighborhood. If heavy weather damages your house, you must find a company that offers reliable water removal in Scottsdale. Our highly trained technicians will be dispatched to your location quickly after storm water causes destruction as it is essential that moisture is contained and removed from a structure and its contents as soon as possible to avoid long-term problems. Expect our staff to respond with a variety of professional grade tools that will pump and vacuum standing and pooling water up swiftly, preventing further damage to the interior of your home. Our technicians responding to your emergency hold industry standard Institute of Inspection Cleaning and Restoration Certification including education on how to locate hidden leaks that may be otherwise overlooked and proven techniques to dry out the area promptly. Don't let a basement leak ruin your home. The technicians at SERVPRO have specialized knowledge to support their assessments of what items can be dried and restored and which may need to be replaced after they complete the post-storm water removal. We carefully consider the damage to the structure and its contents as we make our recommendations and complete the work. Our advice will help you avoid the risk of mold or other lingering effects of the weather damage. The goal of our overall water removal and restoration is always to leave your home and personal possessions “Like it never even happened” after our thorough efforts. We will guide you through every step of the plan to remove the water and repair the damage that resulted including working with your insurance company to ensure every inch of your home is safely restored at a suitable cost to you. 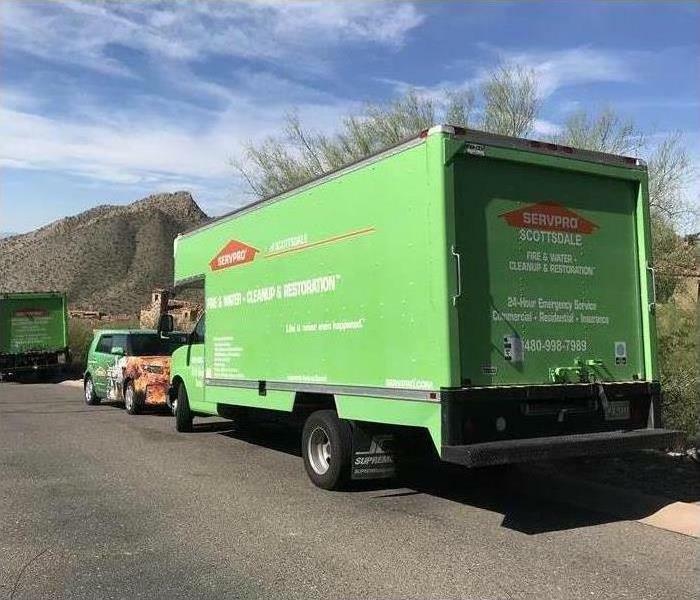 SERVPRO of Scottsdale has both the staff and the equipment to meet your water removal needs after severe storms, or simply a burst pipe, has affected your home. We respond 24 hours a day, seven days a week with just a call to our dispatchers at (480) 998-7989. When people want it like new, they think of SERVPRO, leaders in the field. Nationwide, water restoration and disaster remediation companies aren’t hard to find. What is hard to find, however, is an expert firm with as strong a reputation as SERVPRO. SERVPRO is an exception place to hire but also to own. 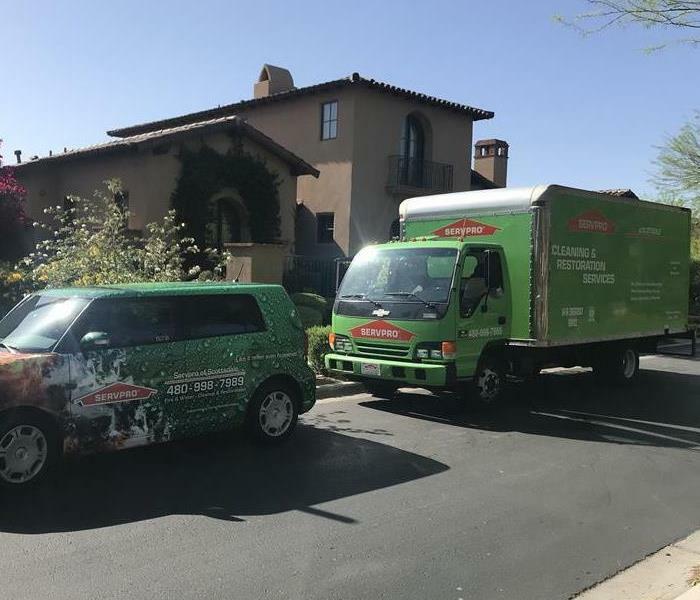 Learn more about what makes our company so successful and some of the top reasons you should consider a locally owned SERVPRO franchise in Scottsdale, AZ. Tornadoes and so much more. When people want it like new, they think of SERVPRO, leaders in the field. It’s clear why people hire us. Now, here are some of the reasons they join our team. With more than 1,600 franchises that are individually owned and operated, SERVPRO has a huge system. This benefits customers who can always find a nearby vendor, but it also helps franchisees, who can partner with nearby certified franchises or get advice and support when needed. The SERVPRO franchise network consistently rank within the top 20 on the Entrepreneur Franchise 500 ranking, ranking No. 1 in the cleanup and restoration industry for 2018. That’s the ninth consecutive year and proof that we keep our partners happy. Consumers could choose anyone for water damage restoration. But over the years, SERVPRO has gained a reputation for the best service and results second to none. That means a SERVPRO franchise starts out ahead of the game. SERVPRO happily serves customers across the country, providing a clean environment and peace of mind when people need it most. Consider joining the SERVPRO franchise team and join a proud legacy.